It's been awhile since our last meetup, but it was worth the wait. So excited about this one! 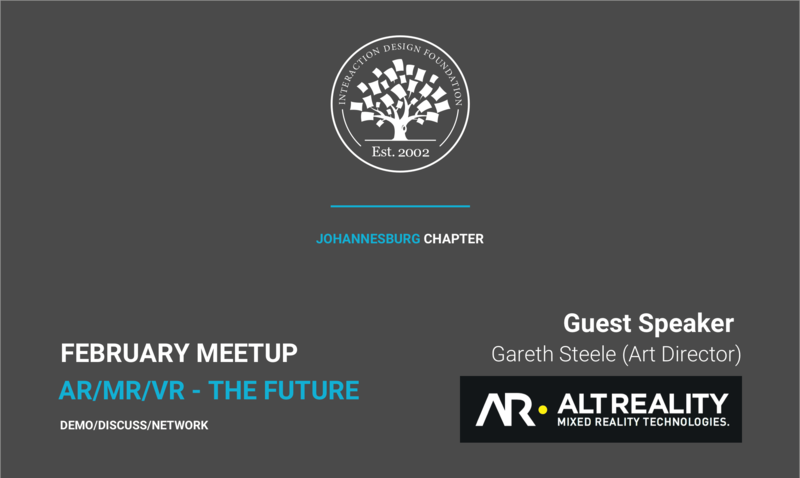 ALT REALITY, is a Technology Studio, in a league of their own. Creating Virtual Reality experiences by merging custom software and hardware applications. Bio: Gareth is freelance Art Director and Designer from Johannesburg. He has a degree in Information Design from the University of Pretoria, where he subsequently spent three years lecturing part time at the Department of Visual Arts. He worked specifically within the sphere of second year ideation, mixed media and handmade typography studies. Concurrently, he worked for some of the biggest Advertising and Design agencies in Johannesburg. Throughout his years working with the industry, he has chosen to focus on social design projects, systemic design thinking, and new technologies with mixed media applications. Gareth is currently working on two technology startups in Braamfontein.